During the holidays I tend to dress up more than any other time of the year and I don’t like the stress or cost of buying a new dress every year for parties or Church services. I have a black wool dress that I absolutely love and no one would ever know it’s the same dress year after year. That’s because I change it up every year with elaborate jewelry, a pretty shawl or an elegant scarf. I’m going to show you how easy it is to make a scarf like this one! You can modify this scarf anyway you like. You can use more casual fabrics if that’s the look you prefer. 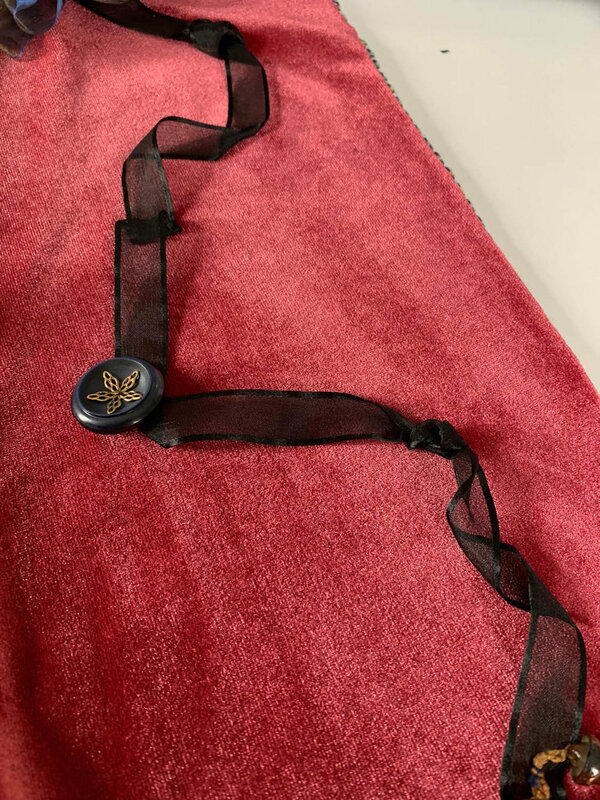 Look for unique embellishments like ribbon, buttons or beads. For a more casual look maybe you’ll want to use fun trims or pompoms! I used two different fabrics for my scarf. They are both pliable which is necessary for the perfect drape. I liked using two complementary fabrics to give it a bit more character but it’s not necessary to do so. Choose fabrics for front and back of scarf. Measure a 9” width x 57” length from front and back fabric. Mark a line 9” from edge across length of fabric. Cut along this line and do this for both front and back of scarf. Be abstract and creative as you experiment with trims, buttons, beads and ribbons. I made these cute Step by Step Simple Ribbon Flowers for Embellishing which I used to attached to this dressy red velvet scarf. 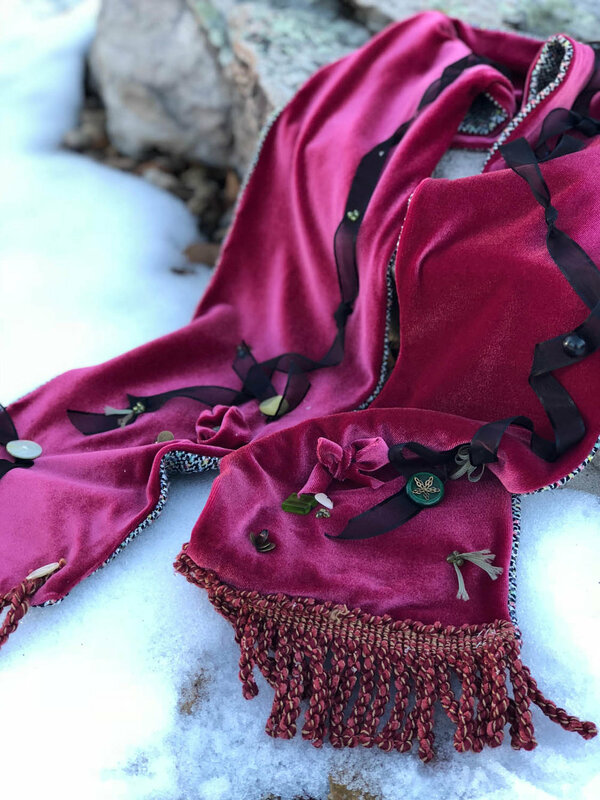 I also used some of the fabric from the back side of this velvet scarf to make the No-Sew Fringed Fabric Scarf. With right sides together, pin along fabric edges, down the length of scarf. Sew a straight line down the length of scarf, using a 1/2” seam allowance. Continue to sew around scarf, leaving about 5” for turning scarf right side out. Very carefully, turn scarf right side out. Take care not to pull off any of your embellishments. From the non-velvet side, carefully press along stitched seams seams to help “sink” the stitches. At the opening, turn under and iron down 1/2” where you turned your scarf; the opening will be stitched closed when we attach our side trims. Tip: Pressing velvet is delicate work. It is easy to mar the pile with an iron, so use only steam, and don’t allow the iron to touch the velvet. To finish edges of the scarf, sew down any trim or tassels that appeal to you. I used a leftover upholstery trim on one of my edges and carefully used my sewing machine to attach. On the other end of my scarf I twisted a length of trim around a button to form a tassel. These are all just ideas so get creative with what supplies you have! This project looks a lot more complicated than it really is. Use your imagination and maybe some supplies you already have in your craft room to create something that’s unique for you! I’d love to see what you make so please be sure to email me photos of your finished scarves. Happy Holidays!